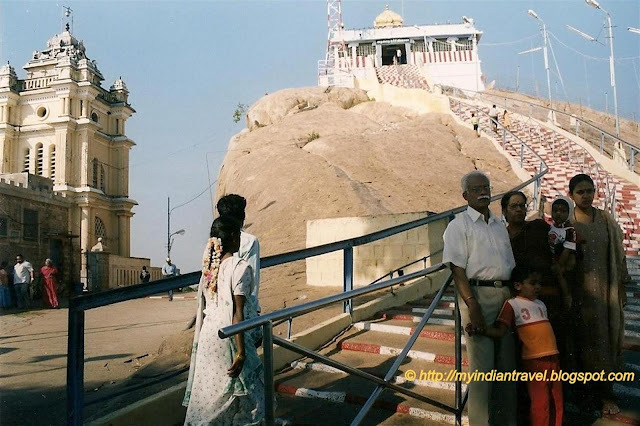 At Trichy, the Rock Fort is a a huge 83 meter rock which is approximately 3800 million years. Uchhi Pillaiyar Temple is located right on top of this peak. One can reach this Lord Ganesh shrine by climbing a series of steps approximately 350 steps. This impressive 7th century temple during reign of Pallavas and completed during the period of Nayaks of Maduri. One can reach this shrine by climbing a series of steps approximately 350 steps carved out of the rock. Half way to the peak, we have to pass through another ancient temple Sri Thayumanavar Temple. Tough climb to the top is eased by the soothing cool breeze. Though the temple is small it is worth the visit. This is a very impressive setting for the temple. That's quite a climb no doubt a deliberate part of the pilgrimage to worship at the shrine but it looks worth the effort. Good photo and informative description. That’s stunning capture on the rock temple! Very impressive at the top of that hill. What an amazing place, I'd love to climb those steps. It would have be very special to get me up those steps. How's about I watch you climb up there and take photos of you coming down? :-) Very interesting! Amazing and beautiful place, Rajesh, and such lovely, peaceful skies for a backdrop! Have a wonderful weekend! What an impressive site!! Boom & Gary of the Vermilon River, Canada. It looks so precarious perched up there. Love the stripey steps. This is another excellent view of India! Visiting from Skywatch, have a great weekend! a perfect day with blue skies to enjoy a visit in this historic spot. I might be able to make it up (maybe, on a good day ;>)).....What a beautiful temple. Beautiful day to visit such an impressive place. What an impressive place to build a temple! Thank you for yat another glimpse of India. Hi there - what a great place. How long must it have taken to build such a place? Wow that's a lot of steps to climb. I doubt I can climb. The design of the steps looked so unique and beautiful. Beautiful.. I still have not visitied this great landmark of Trichy..! Thank you all, it is a nice place to visit. beautiful temple on top of a rock. What a climb up so many stairs. Thanks for sharing your blues. Wow a temple on top of a rock, awesome! your picture says this is worth a visit. But what a climb. It's amazing! Have a fabulous week. Thank you all for appreciating this historic place. road to temple , road to serenity and bliss ! Thank you all for appreciating this hilltop temple.